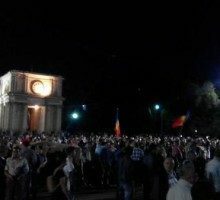 The protest day organized by opposition Igor Dodon’s “Socialist Party” and Renat Usaty’s “Our Party” in Kishinev has ended. The organizers of the rally gave an ultimatum to the government: the permanent protest will go on until the heads of the country and government bodies resign. 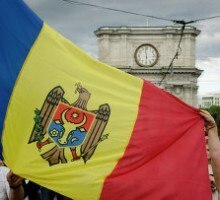 The coalition of Moldova socialists and “Our Party” have declared joining the indefinite protest in Kishinev. “A total of 50 thousand people participate in the event. We launch a non-stop protest with this demonstration,” the leader of socialists Igor Dodon said. Kishenev maidan is primarily organized by “DA” platform (DA standing for “Dignity and Truth”). 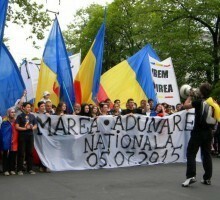 “DA” are unionists, in this case – proponents of Romania absorbing Moldova. For the time being, protesters demand the President and the Cabinet to step down and new elections to be held. However, it won’t take long before calls for joining Romania will reappear. This Tuesday, the former Romanian president, Traian Basescu, evoked this idea of Romania absorbing Moldova. 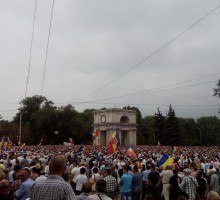 Approximately a thousand people have gathered on the square before the government building in Moldova. The stage has been raised here. Protest leaders are rising to the stage and give speeches. The contact group of the civil DA (“Dignity and Truth”) civil platform is prepared to start the negotiations with the President of the country Nikolay Timofti, Parliament speaker Andrian Kandu and prime-minister Valery Strelets. 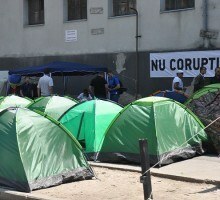 The number of tents has increased; people bring food to the protesters and raise money for them. The protests against the current government in Kishinev continue for the fourth day in a row and are growing. 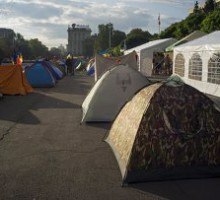 The tent camp next to the government building has grew over the night and now includes up to 250 tents. Sympathizers bring food and hot drinks to the protesters. The participants intent to protest until the authorities comply with the demands of the DA (“Dignity and Truth”) civil platform. The head of the press center of the rally, Andrey Nastase, declared that the President of the country Nikolay Timofti has made a big mistake when he refused a dialogue with the protesters contact group. The authorities are outlaws from this day on. Now everybody knows we don’t have a president, a primer-minister and a speaker. Everybody knows these are just puppets! We are a great power together. We will protest on, fight for the resignation of the government, for early parliamentary elections and an elections of the new head of the country through nation-wide voting. DA (“Dignity and Truth”) civil platform which organized the rallies in Kishinev does not want to have anything to do with politicians from other opposition parties, as well as parties, which have formed the ruling coalition, said the DA rally press-center head Vasile Nastase. 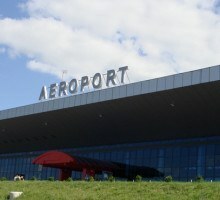 LifeNews channel journalist and cameraman were detained during passport control in the main Moldova airport. Russian TV channel correspondents, Natalia Kalysheva and Aleksey Kazannikov have spent approximately eight hours in the airport transit area. Their passports were taken away from them, instead customs officers have issued them a paper listing allegations according to which the journalists are banned from visiting the country. Customs officers told the journalists that Moldova had no interest in a Russia TV channel covering events in central Kishinev. The night in the city was calm. 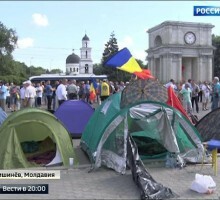 Previous evening people left the National Assembly square, with only a hundred or so activists staying in the tent camp near Cabinet of Ministers building. This morning food and warm clothes were brought to the protesters. A money raising campaign was organized in order to support them. The messages coming from the mass media signify that a “Euromaidan” scenario has been launched in Moldova. Crowds of people have been led out to a square in Kishinev (using legitimate complaints against the government as a pretext). 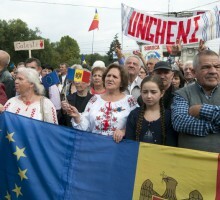 However, the Western media covers situation as if the crowd was representative of the whole Moldovan people. The media presents the actions of various provokers as actions of opposition activists. The law enforcement agencies are paralyzed and the police is unsure and reluctant to act. Show business stars are being used to gather the crowd on the protest site.